The Essential Oils are extracted from different parts of the plants like leaves, flowers, twigs and various other parts. We have a wide assortment of essential oils to suffice the variegated requirements of our wide client base. The concluded range of oils offered by s includes menthe Piperita oil, Mentha citrata oil, Mentha Arvensis oil, Indian basil oil and Indian spearmint oil. To match with the needs of our precious patrons, we offer essential oils in formulations and configurations as per their requirements. 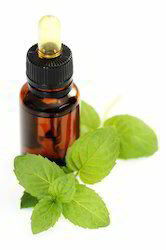 We are a well-known market participant in offering a popular herb known as Mentha Piperita Oil. It can be used in numerous forms like oil, leaf, leaf extract and leaf water. Also known as Pepper Mint oil has varied uses like a solution to a cough, cold, sinus infections and respiratory infections. Moreover, it has a vast number of domestic and industrial uses and thus widely in demand. The offered oil is compliant in prevailing industry standards. We are influential in yielding and offering an herb with long traditional of medical use, Mentha Arvensis Oil. Used for a cough, cold, ulcers, headaches, increase blood flow, digestion improvement, etc. Furthermore used for industrial purposes like perfumes, scented products, cosmetics, sprout control in potatoes and infestation of ants, plant lice, moles etc. The offered oil by us is highly regarded for its purity and concentration. Our packaging ensures the preservation of its natural goodness. 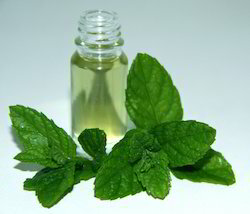 We are known to offer the wide range of Spearmint Oil Indian. Rectified grades available to fit customer specifications. Being a quality conscious firm, we are involved in offering an organic compound made synthetically or obtained from corn peppermint, peppermint or other mint oils known as Mentha Citrata Oil. Used on perfume, deodorant, expectorant, parasiticide, stimulant, stomachic, tonic and vermifuge. Furthermore used in manufacturing process of perfumes, detergents etc. To ensure compliance we make this available to our customers after a series of tests and offered as per standard market rates.